My art lives somewhere between reality and expression, contemporary and realism, I strive to record momentary impulses of the world around me. I paint fast and with lots of emotion never knowing when I will stop. My paintings evolve constantly changing in form, technique and color; some ending with a pure impression and others more defined. The manipulation of shape and texture creates a colorful piece exhibiting energy. I experiment with different materials and techniques. As a result I have a hard time duplicating a style. Each painting is truly one of a kind. 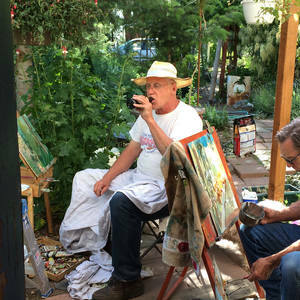 I do several plein air events per year and enjoy the challenge of selecting subject matter and completing a painting in a few hours. When I was a child I aspired to paint the most beautiful painting in the world. Now I aspire to expressing my moods, motions, commentaries and sarcasm in painting with the naivety of a child.